Hello, this is Osvaldo calling from the edge of a glacier. If you are wondering what we are doing here, we are here today because we climbed Illusion. Do you believe that! These are tough ladies! Micheline and Chris never stopped climbing. Today was another successful day. We started around 9 am in the morning after a nice breakfast and we summited at 1 in the afternoon. Now we are just here on the glacier and are headed in the direction of our Base Camp. I am impressed with these ladies because they never say they are tired they always just keep going and that was very good. Today was a very good day and I will call you back when we get to Base Camp. 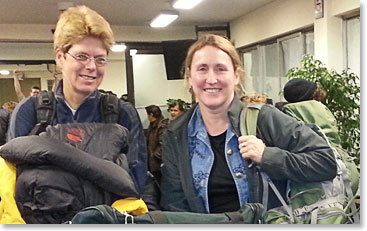 Great job to Chris, Micheline and the Berg Adventure team for their accomplishments in Bolivia this week! Osvaldo called the office later today to report that the team has made it back to Base Camp. He said the climb went very went and that Micheline and Chris are very strong! Tomorrow they will return to La Paz for a day of rest and celebration after two great climbs. Congratulations team on your summit of Illusion (17,487 ft/5,330m)!